We know your trip to China is very important to you and you do not want anything to delay your trip. Besides all other preparations, one of the most important thing is to make sure you have a Chinese Visa on your passport. Following are list of items you may need to know about the Chinese Visa. The Chinese Visa has few dates on it. You want to make sure you will enter China before the “Enter Before” date. And you may stay in China for “Duration of Each Stay” days for each entry. If there is a valid Chinese Visa on your old, expired passport, you do NOT need to apply a new Chinese Visa. You need to bring the old passport with you and show the valid Chinese Visa to the officer when you enter China. If you need to apply a Chinese Visa for your trip, you will need to know the following before you send everything to us. Your passport must have at least 6 months before it expires (1 year if you want to apply 10 years multiple entry visa). You must have at least 2 blank Visa pages (NOT Endorsement pages) on your passport. The application form must be completed on a computer and be printed single-sided. The applicant must sign and date on page 4. If the applicant is under the age of 18, one of the parents must complete and sign sections 4 and 5 on page 4. 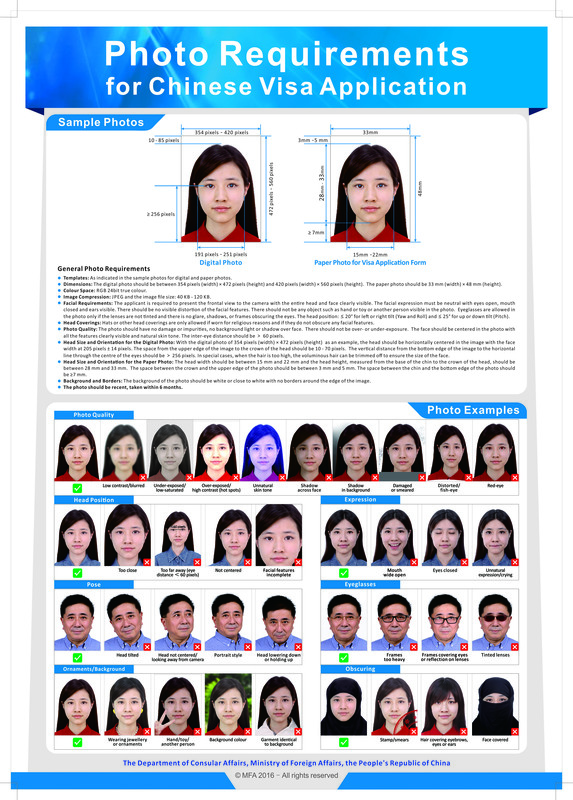 The Chinese Embassy has very strict requirements for the application photo. Please read HERE for the detailed requirements. VMS does provide a special photo service for a $15 fee, we will adjust your digital photo to meet the size/background requirements. Please contact us if you need such a service. A copy of the applicant’s driver license or local ID is required. If the minor applicant does not have such ID, a copy of one of the parents’ ID is required. If the purpose of the trip is sight seeing (not visiting anybody), please include a copy of the round trip flight tickets. The tickets mush have the complete information of the passenger’s name (your name), the departure date, the return date, and the airports. Make sure those information is not cut off when print out the tickets. Based on your profession (for example, media professionals and religious workers, etc), you may also need to provide a letter from your employer to state that you will be on vacation and will not performing any business related activities during your China trip. Please make sure to include a copy of the first page (photo page) of your passport. If you have visited China before, please also include a copy of the most recent visa. If your name on the current passport differs from that on the previous one, you must provide an official document of name change. Copy of your green card, both sides. Copy of your previous Chinese Passport. Payment – You can either pay online with your credit card or include a check in your package, with the total amount shown one the invoice/receipt, payable to Luc Consulting LLC.